HOBOKEN, N.J. – Bijou Properties has announced Park + Garden in uptown Hoboken is now fully leased. An effective rental program conceived and executed by The Marketing Directors, the building’s exclusive leasing and marketing agent, was completed less than ten months after the collection of 212 “green” apartments officially opened to the public. The success of Park + Garden in quick fashion is a vivid indicator a strong market exists in Hudson County for environmentally-conscience, LEED-certified developments which provide significant savings in monthly utility bills created by incorporating energy-saving heating, cooling and lighting designs to achieve a noticeable reduction in energy usage based on industry standard comparisons. Park + Garden is the third sustainable residential building developed by Bijou Properties in uptown Hoboken, where the locally-based company is creating a vibrant and bustling live/play environment along the 14th Street corridor by introducing homes with eco-friendly features, first-class recreational amenities and services and an ideal location minutes from New York City to a high-demand rental market. The Marketing Directors’ extensive knowledge of New Jersey’s Hudson River Gold Coast and nearly 40 years of experience leading aggressive leasing and marketing programs keyed Park + Garden’s ability to stand out in the saturated Hudson County rental market. 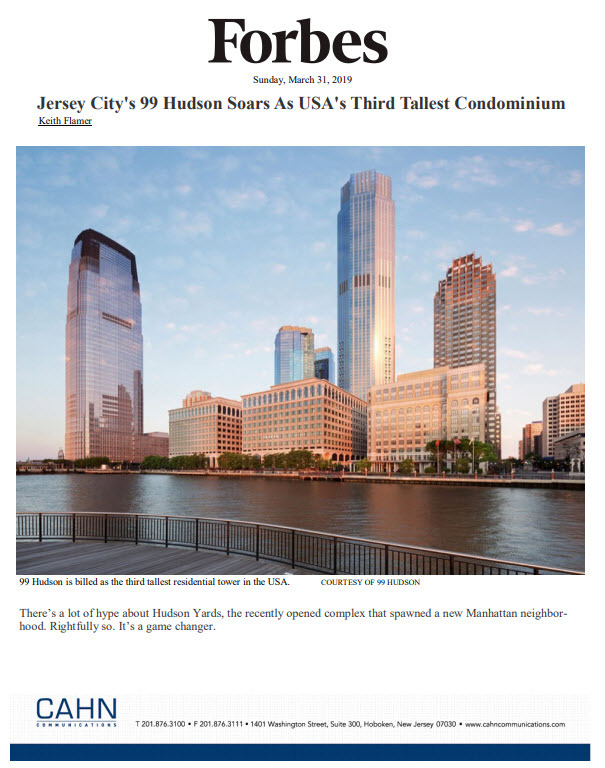 “For more than a decade Hudson County has been one of the strongest rental markets in the New York Metropolitan area,” says Jacqueline Urgo, President of The Marketing Directors. “Developers recognize the rising demand and the inventory of new construction apartments is growing dramatically in cities such as Hoboken and Jersey City. Competition is tough and renters have more and more options for an upscale urban apartment lifestyle. Designed for LEED® Gold certification, Park + Garden consists of two connecting 12-story residential towers sharing a lavish amenities center and an enclosed parking garage. There’s also 13,000 square feet of street-level retail space and 32,000 square feet of educational space. Bijou Properties and The Marketing Directors are now carrying on the appeal of upscale Hoboken rental living just a few blocks south of Park + Garden at Vine, a new 11-story, building consisting of 135 apartments located at 900 Monroe Street. The environmentally-conscience building also features residences with energy-saving features such as Energy-star appliances and low-flow fixtures which equate to lower utility costs, an advantage not overlooked by renters who have chosen Vine. Conveniently situated adjacent to the 9th Street Hudson Bergen Light Rail Station, Vine follows in the footsteps of Park + Garden with upscale, energy-efficient one-, two- and three-bedroom homes, five star amenities and quick access to New York City and throughout New Jersey’s Hudson River “Gold Coast,” including Hoboken’s PATH, New Jersey Transit and Ferry terminals with service to Manhattan. Designed by Marchetto Stieve Higgins Architects, the building’s homes boast sustainable bamboo flooring, oversized windows, kitchens and baths with modern fixtures, Frigidaire and Bosch Energy Star appliances, granite countertops and modern cabinetry; and lavish baths with recycled porcelain tile. Some apartments also provide an additional den. Monthly rents start from $3,325 and residences are available for immediate occupancy. Recreational and social amenities at Vine include an outdoor pool and sundeck, landscaped terrace, state-of-the-art gym, clubroom, fitness center, landscaped roof terrace, bike storage and a 135-car onsite automated parking facility. In addition to the new residences and amenities, Vine features 13,500 square feet of street-level retail space, occupied in part by a Daycare Center. The developers are also creating an adjacent 7,000 square-foot public park. Vine has been built in accordance with the U.S. Green Building Council’s (USGBC) standards for LEED ® certification. Vine will be the fourth LEED-certified building introduced by Bijou Properties in the City. The overall development will further the City’s vision of a vibrant commuter neighborhood on Hoboken’s western edge. Two decorated model homes are available to tour at Vine. For additional information, please visit www.vinehoboken.com or call 201-386-VINE (8463). The Marketing Directors’ onsite Leasing Office is located at 900 Monroe Street, Hoboken, NJ 07030. Founded in 1999 in Hoboken NJ, Bijou Properties designs, develops & manages the highest quality sustainable buildings and has become a recognized leader in the field of green development along the Hudson Waterfront. Recent projects include Park + Garden, Garden Street Lofts (NJ’s First LEED Gold Residential Highrise), The Hostess Factory, a 42,000 square-foot retail restoration including a 20,000 square-foot Green Roof; and Edge Lofts, a Midrise residential project at 1405 Clinton Street which is a candidate to receive the first NJ LEED Residential for Homes Platinum designation. Beyond its individual properties, Bijou Properties is focused on creating better neighborhoods and healthier environments for the community at large.